In 2010, we helped Stark RFID rebrand and move out of RFID inventory management for brickyards, and into RFID event & venue management for some of the leading names in sports and entertainment. We continue to help Stark sell against barcoding, which is clearly inadequate for the changing access control, engagement and analytics needs of large venues and events. With more major brands converting to RFID solutions, it was time to take on another mature technology — paper ticketing — and the paper ticketing companies coasting on incumbency and their customers’ fear of the unknown. Stark RFID launched ValiDate ProTicket to bring NFC’s advanced technology to ticketing — paper tickets, season ticket cards, credentials, wearables, collectibles of all shapes and sizes, and mobile phones. 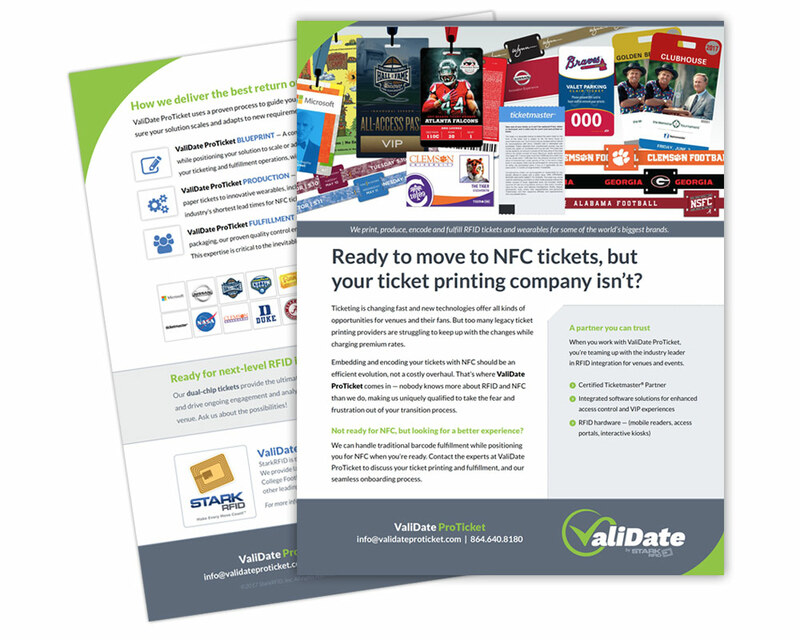 The new ValiDate ProTicket brand and website were a direct attack on the soft white underbelly of the paper ticketing industry, offering a tested and proven solution to prospects tired of being charged premium prices for outdated products. We created the ValiDate ProTicket branding and positioning, using Stark RFID’s fast-growing brand equity to launch a quest for market share against well-entrenched competition. Competitive comparison of NFC to barcoding for access control, fan registration, engagement and interaction, digital spending and real-time analytics. ValiDate ProTicket has come out of the blocks fast, with a series of new customer wins. That’s what happens when disruptive technologies make a simple, compelling case for their benefits. Our logo design incorporates the “V” of “ValiDate” as a check mark and stand-alone icon, to reinforce the idea that validation for access control, interaction, spending and analytics is simple and automatic. The icon also appears on any device validating a ticket — a mobile phone, scanner or portal. Our objective here was to deliver a simple, engaging site that provided a scannable argument for the advantages of digital ticketing. 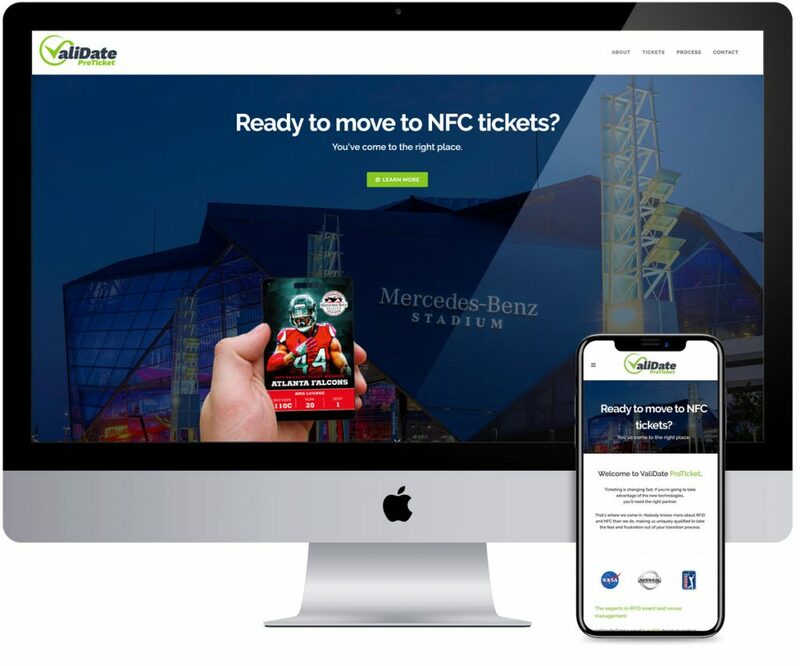 The site, one long page for fast, easy wayfinding, addresses the key issues and concerns of event and venue managers, with a concise description of ValiDate ProTicket’s advantages and the proven process for conversion to digital tickets and fulfillment. We customize all major presentations for prospects and specific tactical requirements.